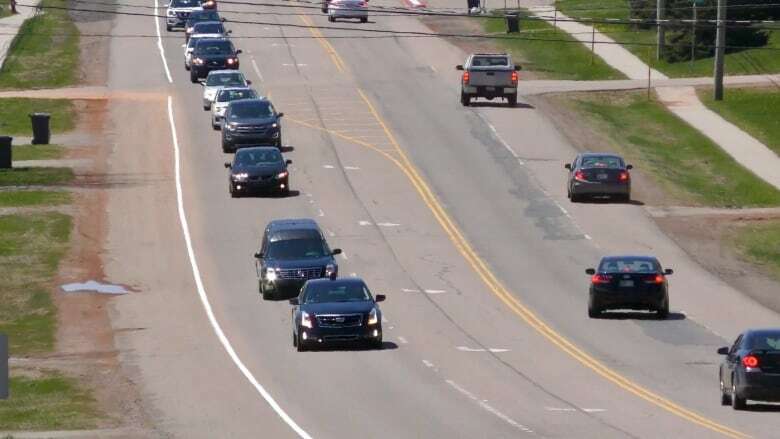 Slowing down for funeral processions is not only tradition on P.E.I., it's also the law — the only province with such legislation. But Islanders take it one step further — many actually pull over as a sign of respect. 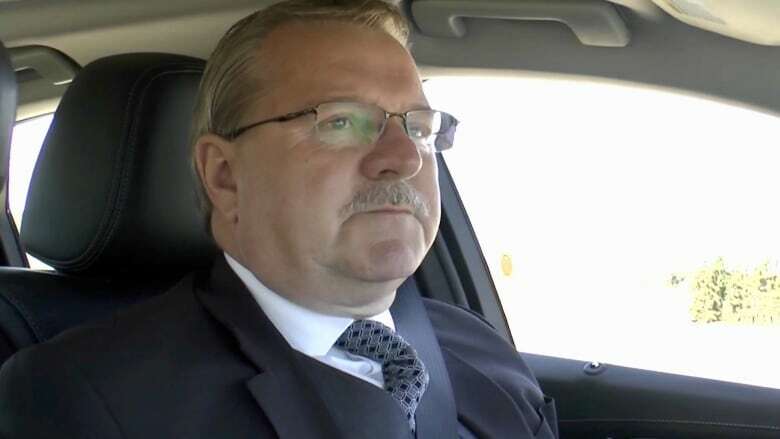 As the mourners file out of the funeral home, I climb into the lead car in the procession — just ahead of the hearse — with driver Kevin Gallant, owner of Hennessey Cutcliffe Charlottetown Funeral Home. As we leave the funeral home parking lot, Gallant edges out onto the street, making sure traffic has stopped in both directions. Now begins the final journey for the deceased to a church service in a village 28 kilometres away. I have a front seat view of a respectful tradition that has been carried on since the horse and buggy days on P.E.I. 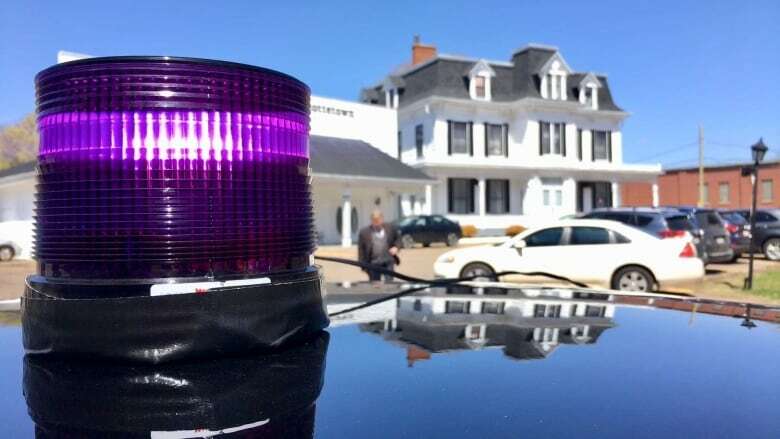 Prince Edward Island is the only province in Canada where drivers are required to slow down when approaching a funeral procession. But most Islanders go one step further to show their respect for the deceased. Many actually pull over to the side of the road until the procession passes. "It's just support from the community for the family," said Gallant. That's important for the grieving family, he said. "This is [their] mom or dad or brother or sister," Gallant said. "It's probably one of the most difficult times." 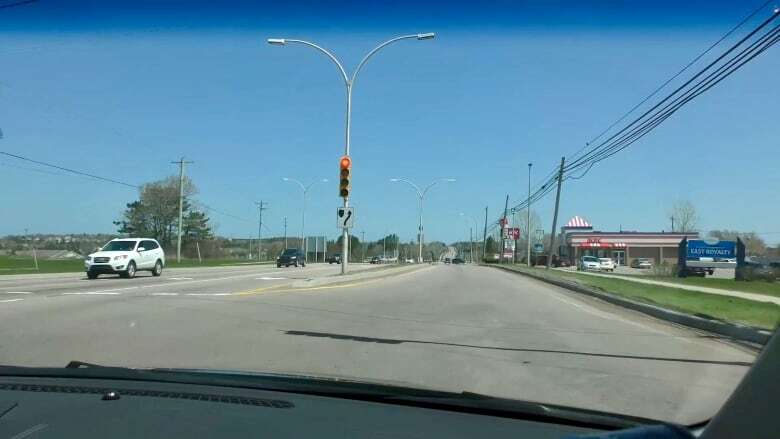 "I think it probably started as a tradition, and it has worked itself into the Highway Traffic Act," said Graham Miner, director of the province's Highway Safety Division. 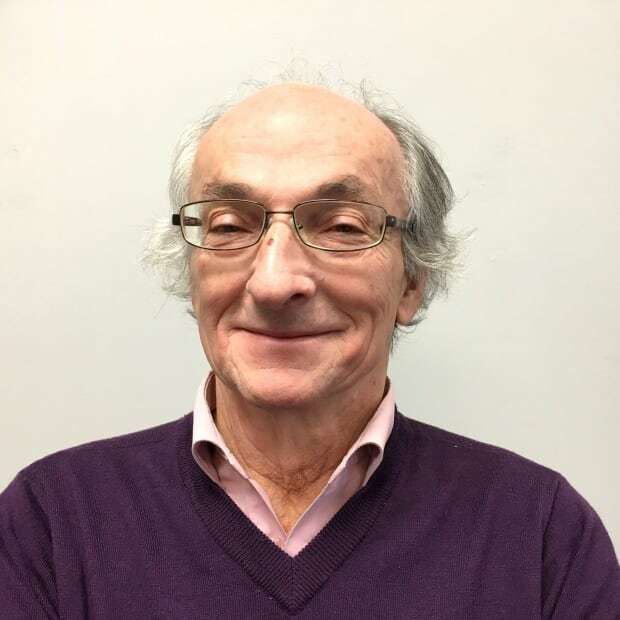 "It's certainly a nice tradition in P.E.I.," Miner said. Not all Island drivers slow down or pull over, but Gallant doesn't believe it's intentional. "I know we're not quite as fast-paced as some of the bigger centres for sure — but I mean people always have somewhere to go, they're always in a hurry. I think they just don't see the funeral procession coming," he said. From my vantage point in the front seat I see most cars do pull over but at one point, six out of seven cars pass by without slowing. 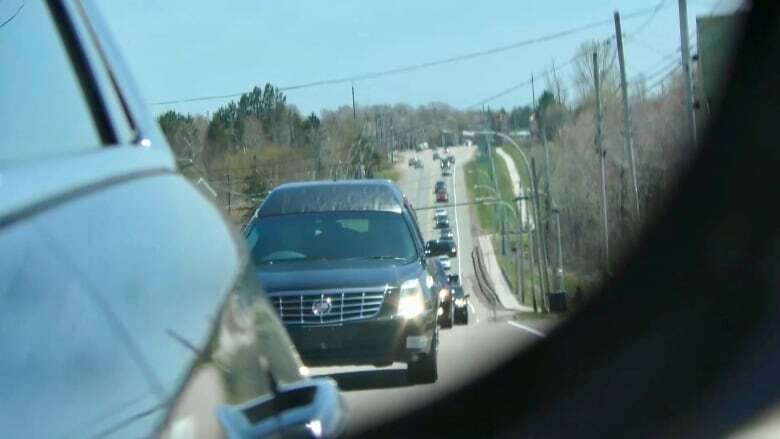 "But if you look in your rearview mirror, you can see that they've realized that it's a funeral procession, you'll see them pulling over to the side of the road usually by the time they see the hearse," Gallant points out. And he's right — all of the cars do pull over. There's one thing drivers should not do when approaching a funeral procession, Gallant said. "I've had one or two people that have stopped in the middle of the road," Gallant said. "It sort of makes it chaos for the person behind because they're not expecting that. I've seen some near misses that way." Safety is a big concern for Gallant — after all, he's leading a procession of 25 or 30 cars through major city intersections. The law doesn't allow processions to go through a red light but Gallant will stop his car while the light is green to get drivers' attention. The responsibility can sometimes be nerve-wracking, said Gallant. "You're trying to make sure everybody gets through and you're always sort of looking in your rearview mirror to make sure everybody's doing OK."
Fortunately Gallant has only seen a few minor fender-benders in his 30 years in the business. At one time, the general rule for vehicles in a funeral procession was to turn on their headlights, but with the advent of daytime running lights, spotting a funeral procession became more difficult. Now, lead cars have a flashing purple light on top while the hearse has alternating flashing headlights. 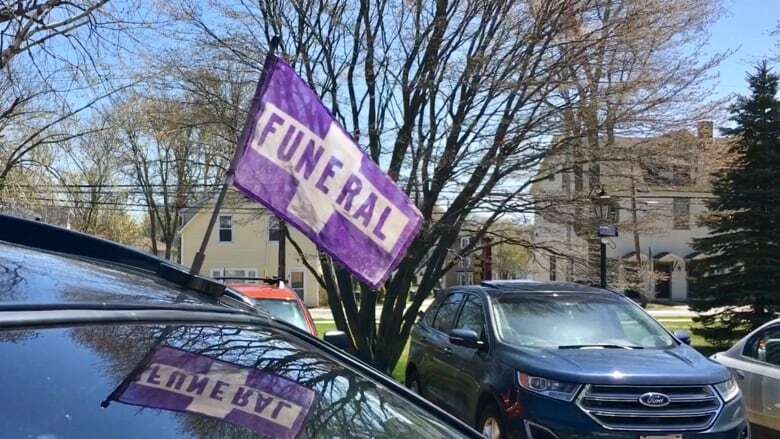 Some funeral homes also provide magnetic flags for vehicles in the procession that say "funeral." As the procession leaves the city and moves onto the highway, Gallant drives just below the posted 90 km/h speed limit. 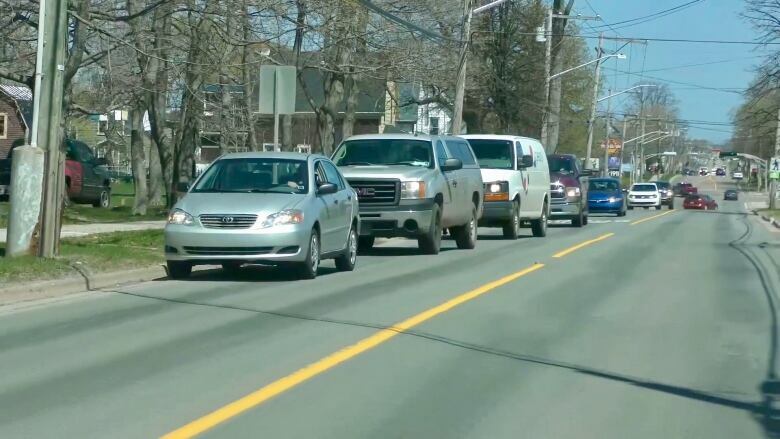 He said occasionally, a driver will try to pass a procession, which is illegal on P.E.I., and most other provinces. "They might be back in the lineup and traffic is going along at 70 to 75 km/h and they probably just had enough," Gallant said. "So they decide they're going to try to get by it." Once again, Gallant doesn't believe drivers pass on purpose. "They might not realize what they're into until they get up further into the procession and realize that it's a funeral procession. There's not much they can do really except to keep on going and pass it." As another tourist season approaches, Gallant will be a little more wary. "Tourists aren't as likely to pull over as Islanders," he said. "Some do, but the tradition may not be as alive where they come from maybe, especially if you come from bigger centres." "I hope it's something that continues to stay with us," Gallant said. "Traditions go by the wayside but I think this is one that's really ingrained in us. The Island is pretty steeped in tradition."